3 Point Tractor Hitch - Welcome! 800-210-9955, and find out all the benefits of carrying our product line for your customers. The FLEXpoint® Tractor Hitch System is the FIRST and ONLY patented, 3-point receiver hitch that increases the usefulness of your tractor. 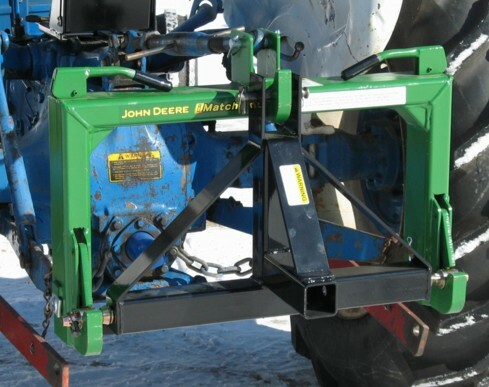 • Fits all tractor brands with a 3-point hitch system. • Haul behind your tractor what you’ve been towing behind your pickup or SUV. Just remove the towing insert from your truck receiver and insert it into the FLEXpoint® 3-point receiver. • Accepts pin, pintle, ball hitch, gooseneck inserts and much more. 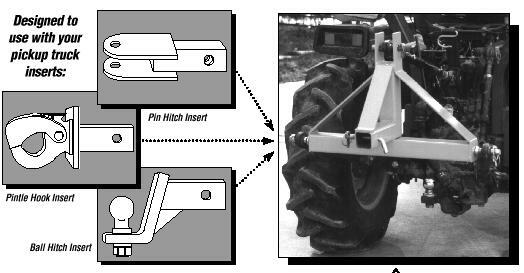 • Use your tractor’s rear 3-point hydraulics to easily adjust receiver height to raise or lower your trailer. • Field proven structural integrity, tried and tested for over 10 years, recognized as the standard for the industry, and endorsed by thousands of satisfied customers, FLEXpoint® allows you to pull virtually any kind of heavy load: utility trailers, boat trailers, horse and stock trailers, salt and manure spreaders, wood splitters, golf course equipment and more! • U.S. Patent #5,690,182 - The patented FLEXpoint® Tractor Hitch design harnesses the power of the triangle to give you optimal towing capacity. • Safer and easier to use than the traditional horizontal drawbar, with greater maneuverability (see how it works below). Don't forget to Like us on Facebook to hear about Special Offers!! Ð¡opyright Â© 2019 Virtue Mart. All Rights Reserved. Powered by Aptuitiv Studio.